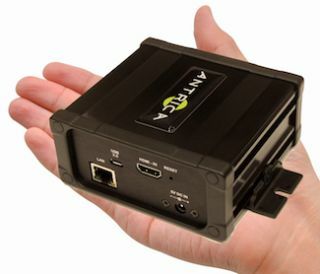 The What: Antrica unveiled the ANT-73000 KVM video over IP encoder, a low-cost H.264 video encoder that connects to a remote PC via HDMI and USB only. The What Else: The remote PC or laptop is connected to the ANT-73000 via HDMI and the desktop image is encoded and streamed using low-latency H.264 coding. The remote PC or laptop’s keyboard and mouse are controlled via the USB connection, which also supplies power to the ANT-73000. Antrica supplies a free application to run on the local PC or laptop, which sends KVM commands to the ANT-73000, allowing control of the remote keyboard and mouse. Video can be displayed using VLC player or Antrica’s low-latency player on the local PC or laptop. The ANT-73000 KVM encoder uses standard fixed IP addresses and works on any LAN or WAN where the local PC or laptop can access this IP address. Data rates of a few megabits per second to 20Mbs are programmable for full 1920x1080 at 60Hz streaming video. Embedded audio via the HDMI input is also supported.